Many people were not satisfy with the way their laptop battery just drain away within blinking of an eyes..
1. 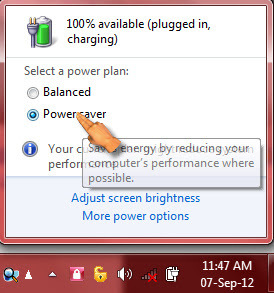 POWER PLAN : Using POWER SAVER as the power plan gives a significant boost to battery life and You can change your power plan by clicking on the battery meter icon in the right task bar on your desktop and select power saver in the options. – Avoid extreme heat getting close to your laptop battery and also raise your laptop above surface ground or table depends if your processor cooler id near to your battery because it will later generate heat to the battery and will reduce its lifetime. – Avoid over charging , what I mean is that if working on your system and the battery meter reads that is 100% fully charged, unplug the ac power cord to save your battery life. – Maintain your display dim, because the higher the brightness, the higher the power consumption and vice-versa. – Reduce your system usage by; removing unused device plugged to the system and closing programs you are no more using. – Avoid Shutting down your system every time instead , u can use hibernate mode , I only shutdown my system thrice a month but more if my system require to be restart . – Avoid battery removal and replacing regularly.